Here are the three helmets I have (the good ones) and just posted here to see them all together. From left to right, a cast from Rick Baker mold (DJ), an ESB made out of a Rick Baker cast (as was probably done by LFL at some point), and an idealized Vader that I made from a Rick Baker cast with everything cleaned up the way it should be cleaned up if you're gonna clean it up, dammit! (in my opinion). I surprisingly like the cleaned up Vader - kind of a perfect blend of ESB and ANH. Thanks for taking a look, guys! It's tragic how slow I am. The first of these was finished in 1995 or so. The last one was finished two weeks ago. Will look at RPF - have not seen Gino rant! Jones!! 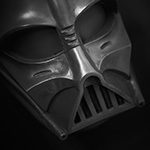 These helmets are giving me Vader envy LOL! They look amazing! 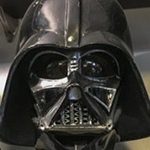 Darthjones, you are very lucky to have these fantastic helmets, congrats. Nice work DJ. I too like the clean hybrid version; looks production-ready. Thanks, gang!!! The truly scary stuff was cutting out a larger chin triangle from a smaller triangle. And stuff like that. These look absolutely stellar. Helmets to be proud of. Is it bad that I can't pick a favorite of the three? Looks like a collection that is best kept together. Beautiful work DJ!!! Beautiful Vaders there DJ. Gotta say though, that I have a real soft spot for the original DJ helmet. When I first got into the hobby, that was my holy grail. I am eager to find out what was used for Rogue One. Am very curious.